To tie in with the release of their fifth studio album, The Puppini Sisters embark on new tour, bringing their fun and sassy vocals to venues across the UK including Sale Waterside Arts Centre. 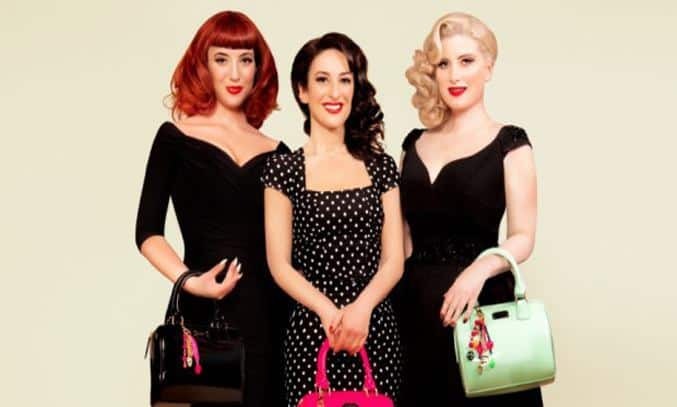 Best known for their close harmony vocals, The Puppini Sisters made their name 10 years ago when their first album Betcha Bottom Dollar won a Gold Disc for international sales. The trio are the 21st century’s answer to The Andrews Sisters and have performed all over the world with artists such as Michael Buble and The Real Tuesday Weld. In a rare treat, The Highlife Tour sees original member Rosana Schura return to join fellow ‘sisters’ Marcella Puppini and Kate Mullins for four nights only. The girls add their trademark jazz and swing twist to everything from The Andrew Sisters and Elvis to Missy Elliot and David Bowie, as well as some self-penned original songs. The 90 minute set opens with the new single Is This The High Life? followed by the crowd pleaser Mr Sandman. Their well-rehearsed, three-part harmonies are pushed to the limit in a ska-swing version of It Ain’t What You Do It’s The Way That You Do It as well as a new original piece in which the girls use their voices to imitate musical instruments. Despite their 1940s style, the set list boasts a mix of classic standards as well as reinventions of pop hits, the trio adding their own unique and inimitable style to The Sugarhill Gang’s Rappers Delight and an epic mash-up of seven money inspired songs including Destiny’s Child’s Bills, Bills, Bills, Madonna’s Material Girl and Rhianna’s B*tch Better Have My Money. The classically-trained trio are backed on stage by a three-piece band featuring Martin Kolarides on guitar, Henrik Jensen on double bass and Peter Ibbetson on drums, and also play a few instruments of their own with Puppini wheezing away at the accordion and Mullins on the blow-organ. In a break from the close harmonies, the girls each perform a solo number with Mullins showing off her talents with a slow, sweet version of Love Me Tender and Puppini taking centre stage for a rendition of a tune she penned herself Everything Is Beautiful. But it is former member Schura who steals the show with her beautiful rendition of Joni Mitchells’ A Case of You. While The Puppini Sisters are clearly talented individuals, elements of the show feel slightly gimmicky at times, a cheesy version of Supercalifragilisticexpialidocious is one example of this, along with the bright and elaborate pom-pom dresses and extravagant hair pieces. A few issues with sound, particularly for Mullins, also interrupted an otherwise slick show. That said, The Puppini Sisters’ fan base is a strong as ever and their gorgeous singing style and re-workings of modern pop songs makes for an evening of feel-good classics that is sure to thrill fans both old and new.